If you are looking for a kung fu style known for its strong training and coupling of internal and external power, you can't go wrong with Bagua Zhang. Bagua Zhang was created by Hai Chuan Tong, a renowned martial artist of the Qing Dynasty, to train Manchu soldiers to quell Chinese rebels. Bagua Zhang derives its name from Ba Gua, the mystical symbol of the eight states of transformation upon which the Chinese book of divination, the I-Ching is based. As a Bagua Zhang fighter, you rely on your unique footwork to literally run circles round your opponent and incapacitate them with a strike where least expected. Bagua Zhang is commonly regarded as a Taoist internal system, with soft flowing movements and mystical eight steps. This is not an entirely correct view - At advanced levels, you learn hard techniques that makes it as aggressive and forceful as any other advanced martial arts systems. Together with basic Bagua Zhang palm techniques, the Eight Palms Fixed Form will show you how to properly use the techniques of circle walking and directional stepping. When fighting, an opponent typically tries to protect his or her body (the "big door" in Bagua Zhang), and the arms and shoulder get neglected (the "side door"). The purpose of circle walking and directional stepping is to train you to pick the right "door" to attack in any given situation, so as to incapacitate your opponent or cause him to retreat. You will not find many punching techniques in the Eight Palms Fixed Form, and would focus mainly on your palms. 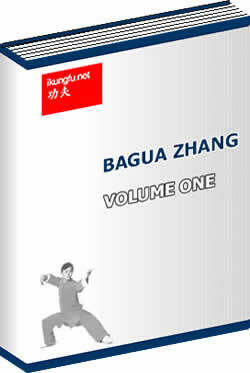 Bagua Zhang believes that an open palm is more precise, provides more options and deals more damage on impact. If you dislike stance training, you will be pleased to know that Bagua Zhang doesn't emphasize stance training as much as other kung fu styles. No rigid horse stances are present in the Eight Palms Fixed Form. The illustrations for the form itself comprise of over 137 carefully created color diagrams in addition to the many illustrations in the main body of the eBook.